Fittingly, “Twin Isle” has a double meaning for us: It represents the easy beach AND bay access that our properties offer. But it also represents us, with two sets of twins in the family. We’ve spent many sun-soaked vacations in Destin with our families, and it comes naturally to bring our guests the same level of delight that we’ve experienced ourselves so many times over. We’re always striving for perfection. Why? You! We adore getting messages from guests asking to book again next summer. In fact, many of our guests are repeat customers, and we love the chance to establish relationships that last over many years – I’ve even emailed renovation updates to ask for advice on paint colors! When we vacation, we want to stay in a comfy, cheery vacation home, and that’s what we’re hoping to bring to you, too. We keep our newly renovated units clean, updated and filled with cheery décor and beach amenities that’ll keep extra packing at bay. Fully equipped kitchens mean that you’ve got a gathering place for family meals, and sunlit living spaces and comfy bedrooms will make you feel like you’ve found your new home away from home (no, you can’t move in). 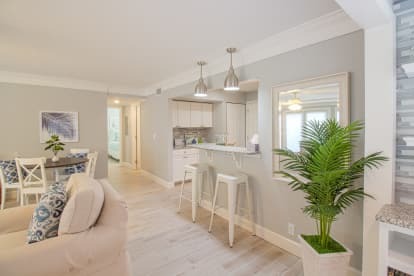 Location is everything – which is why we love Sandpiper Cove on Destin’s Holiday Isle, which has a breezy, private atmosphere and easy access to Destin’s lively shopping and restaurant scene. Our first-floor condos puts the beach one step away from your door – we love strolling out with a cup of coffee in the morning! Plus, the fact that you can go at your own pace – whether that means taking in the magenta sunsets, getting your adrenaline fix on a jet ski or taking the water taxi to a restaurant nearby – makes it perfect for guests young and old. We hope you love it just as much as we do!